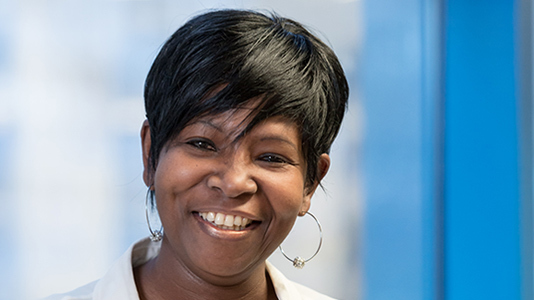 After several years working in the property services department of local government, Angela Anderson found her career at a crossroads. She enjoyed the property industry, but felt that she had more to offer. To broaden her horizons, she took a sabbatical year and worked and travelled around USA while she decided on her next step. When she returned, her mind was made up. Her interest in developing her career in property and the built environment was as strong as ever, and she made the decision to pursue a career as an RICS surveyor (Royal Institution of Chartered Surveyors). To start her journey, Angela would need relevant undergraduate and Masters degrees, which made LSBU the ideal place for Angela. "The University has a very good reputation for its Faculty of Engineering, Science & Built Environment," she says, "and it offers undergraduate and postgraduate courses, which was exactly what I was looking for." Our strong links with industry also appealed to Angela, who was keen for her education to be as practical as possible. The fact that our MSc Building Surveying is accredited by the Royal Institution of Chartered Surveyors (RICS) was another excellent reason for her to choose LSBU for her studies. Angela excelled in her Bachelors degree, graduating from our BSc (Hons) Property Management with first class honours. Her next step was a Masters degree and, as planned, Angela continued her studies at LSBU. "As well as the reputation of the faculty, I was familiar with the staff and tutors and knew how helpful and talented they were," she says. Angela was accepted onto our MSc Building Surveying, and then turned her attention to funding her studies. She applied for the Stuart A Johnson scholarship and was "ecstatic, honoured and proud" to be told that her application had been a successful one. "Without the scholarship, I would not have been able to study my course," Angela says. "It also means that I'm a step closer to achieving my dream of becoming an RICS surveyor, so I'd like to thank LSBU for supporting me." This scholarship, funded by alumnus Stuart Johnson, is being offered to our MSc Building Surveying, MSc Construction Project Management and MSc Quantity Surveying students. Find out more about the Stuart A. Johnson scholarship.